Griffin Theatre Company presents, DIVING FOR PEARLS, by Katherine Thomson, in the SBW Stables Theatre Kings, Cross. 8 September - 28 October. DIVING FOR PEARLS, is an Australian play by Katherine Thomson, first performed in 1991 - a play, then, some 26 years old. However, this production, Directed by, Darren Yap, gives this play an energy and clarity that makes it resonate and feel as if it were written today, in 2017. This is a state-of-the-nation play delivered with confidence by all concerned. A good play - vivid, individual characters in wonderfully observed scenes, with dialogue that crackles and caresses with authenticity, both comic and dramatic, with a distinct ethical contemplation of urgent concern at its centre (even if, for today, the narrative may appear to be, for some, a trifle slow moving); wonderful casting - not a single weakness in this company of 5 actors revealing imagination and courage, utilising their considerable craft skills to deliver Ms Thomson's concerns; an astute Director (not least, in finding the right cast) solving the many location demands of the story with a Costume, but especially, Set Design, by James Browne; with an atmospherically rich, complex Lighting Design, by Benjamin Brockman, that helps propel the dynamics of the action forward, supported by the joint Composition and Sound Design, of Max Lambert and Roger Lock. The majority of this team collaborating familiarly with Mr Yap. On morning radio (Radio National- RN) one heard a Union representative (Sally McManus - Australian Council of Trade Unions secretary ?) disputing the present policies of Michaelia Cash, the Minister for Employment, for the ex-businessman/banker, multi-millionaire, Prime Minister's government of 2017, and its pro-industry and anti-workers stances (attacks). DIVING FOR PEARLS, seen that evening, although, written some 26 years ago, jumped out to one with even more pertinence than ever before, a mere 9 hours later. This play is concerned in giving the honest working poor a spot-light, a voice, so as to be seen and heard. 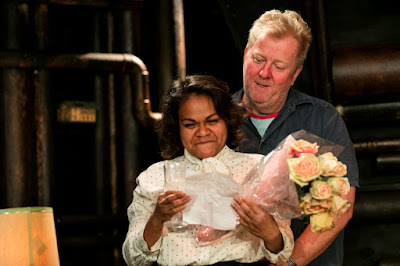 At the centre of Ms Thomson's concern is Den - late 40's (Steve Rodgers) and Barbara, nearly 40 (Ursula Yovich). Den is a shy loner with a big, if, simple heart, still living in his dead parents house, having worked doggedly in the near-by factory, and having never lived or worked anywhere else. He has never felt the need to do or live any other way - he has, relative, contentment. He has a toy train network hobby. He once had a love for Barbara, and has never worked out what went wrong. Barbabra, has worked hard all of her life in an industry of disposable 'goods'- a clothing factory -has had a child with disabilities, Verge (Ebony Vagulans), which she has disposed to her older sister Marj (Michelle Doake), and is now living in a run-down boarding house. Den and Barbara's paths cross again, and, advantageously, Barbara accepts refuge and a relationship with Den as she, aspirationally, seeks to find employment in the hospitality industry with a newly constructed International chain hotel development, on the beach front, nearby. Den lovingly facilitates all her needs, even to taking in her 'surprise' child as his own. Barbara, is played relentlessly, and at some noisome (crushing?) pitch, by Ms Yovich, with remarkable courage, to give us a portrait of a woman driven to a last defence, a fierce narcissistic core by her 'gathering' circumstances, blaming all others, except herself, for her failings, and having no rescuing sensibility to hear those about her who want to love and protect her. Barbara's 'mania', as played by Ms Yovich, is dreadful in its emotional confrontation and is only relieved by the aspect that Den has for her - one of devoted love-sickness - that permits us, as we watch him grow happy with her, to develop an empathy for her - we, nearly, see her through his eyes. It is a scarifying character observed with, it seems to me, a kind of admiring grief by Ms Thomson, and a deep seated knowledge by Ms Yovich. 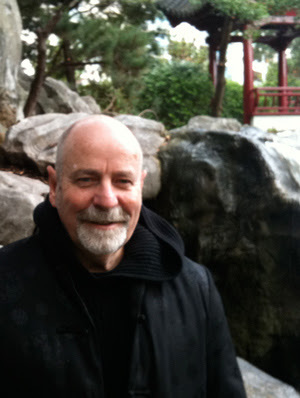 Steve Rodgers is a remarkable actor who draws, it seems to me, from his inner organic centre as a human, to create with simple gesture of action and, especially, thought, the whole of a character's life, his, in this case of Den, Den's simple past, his honest present and his loving aspiration for the future, who grows, belatedly, but inevitably, because of his purity of heart, sensible, to the injustices of his and his fellow workers lives and has the spine of an ethical consciousness to stand up for what is right against the expediency of money - a corrupter of human values. The tragic flaw in Den and Barbara's relationship is the recognition that their difference is one of moral principle - even though they, probably, could not say what it is, in so many words. Barbara wants him to give into the advantage of the money of the redundancy offered by the Corporation, Den can't, ethically, do so. Mr Rodgers gives a great performance to put in one's theatrical memories. Jack Finsterer, as Ron, is a man who began on the factory floor with Den, but who took advantage of his opportunities to become an industrial consultant, and incidentally, Den's brother-in-law, brought in to be one of the many hatchet-men to undo the local factory/industry. Mr Finsterer draws not a knowing 'villain' but an empathetic and compromised man of practical survival. It is a sensitively observed performance of some moving dilemmas. Newcomer, Ebony Vagulans, creates Verge, the mildly intellectually disabled, physically handicapped and abandoned daughter of Barbara's, with a keen eye for detail and insight to the frustrations of Verge's world, blossoming under the care of Den and protesting for him with loving but devastating consequences. Finally, one welcomes back Michelle Doake to the stage, as Marj, the misunderstood and awkward sister of Barbara who only has good intentions but no educated finesse to articulate them in any socially acceptable manner. Her performance is an exquisite one of comic and pathetic dimension - sometimes both at the same time - it is remarkable to watch the 'technique' of this actor with its second-by-second development of surface and character depth. Ms Doake's Marj is not simply, the comic relief function of this play's construct, but part of this play's human tragedy. A good play with great characters and a 'thumping' moral heart. The acting from this ensemble is much to be admired and not to be missed. Direction from Darren Yap, including all of the necessary Design supporting elements of his collaborators, make this Australian play of the past, shine with meticulous study and execution. One hopes that the Emerging Playwright's of the newly announced coming season are able to watch this classic play construction, character realisations and story, with a moral heart (a philosophy), by Katherine Thomson - for to stand on the shoulders of greatness, to learn from observing, can be an advantage.